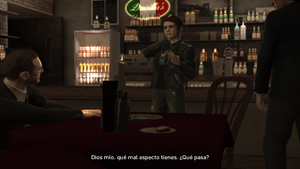 Niko Bellic meeting Ashley Butler at Drusilla's. Meltdown and the LSD worker outfit. Taking in the Trash is a mission in Grand Theft Auto IV, given to Niko Bellic by Pegorino Family capo Ray Boccino from Drusilla's, a restaurant located in the Little Italy district of Algonquin, Liberty City. Ray got Ashley Butler to get The Lost Brotherhood to rip some diamonds off some club owner and hide the ice in some garbage bags to be picked up by Ray. He wants you to go to a guy named Luca Silvestri and pick up the diamond-laced trash. The Liberty Sanitation Department Outfit given to the player after the successful completion of the mission. There is a mission in The Lost and Damned where Johnny steals the diamonds and puts the diamonds in the garbage cans seen in the mission. Niko receives a LSD uniform to wear during the mission, which is then stored to his wardrobe. It is exactly the same as the one worn by regular LSD workers. The "pursuing car" is a rare Oracle XS, which can be obtained by killing both men in the car, and driving it as close to Ray's restaurant as you can, before the mission is failed. Once failed, go to the spot that you were last in the car, and it should be there. This car can be changed to any color desired in the Pay 'n' Spray, without going to default color (dark green) immediately. In the PS3 version this mission can be a little annoying for those playing with the "classic" (i.e. GTA III-era) control set-up, as the control used for accelerating the truck is the same as the one used to open the compactor, so as you drive the compactor will continually open and close (and you'll need to make sure it's open when the bags are being loaded). Having the compactor open during the chase doesn't seem to have an impact on the mission, despite comments being made regarding bags being damaged and diamonds possibly lost. Niko Bellic driving the Trashmaster as Johnny Barbosa and Joseph DiLeo search for the diamonds. This page was last modified on 24 September 2014, at 04:56.